Discussion in 'Misc' started by XoC--, Sep 10, 2014. Blackhatworld Forum members have an opportunity to seize an Early Bird account for? ?I have seen hundreds of Systems, Ebooks, Platforms and Services pass through my business WSO Creative. SEM Compass promises to provide a unique and extremely valuable tool for IM newbies and experts alike.? ?A game changer for SME?s and website owners leading their own online marketing efforts? [*=4]Generate reports for any URL or domain. [*=4]Export thousands of backlinks or domains. [*=4]Isolate what it takes to rank locally from any city/region around the world. [*=4]Instantly analyse google?s 7pack map SERPs. 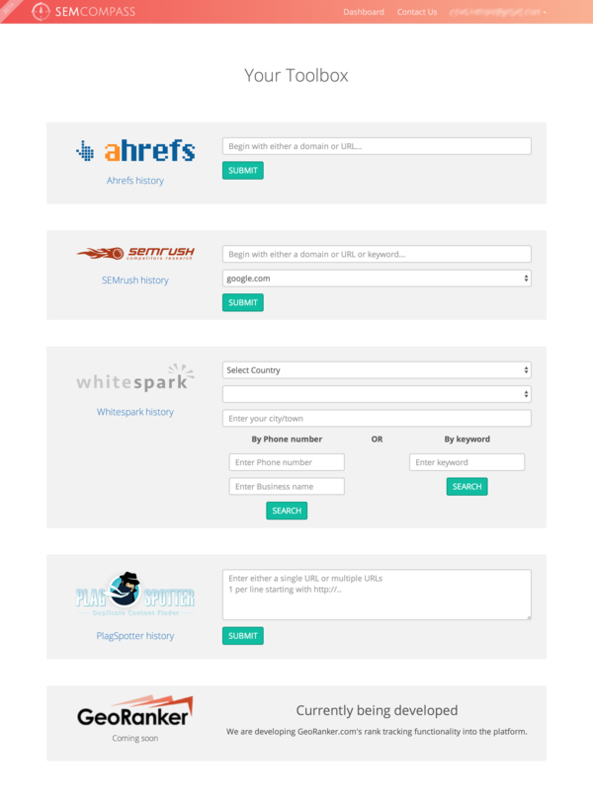 [*=4]Find your competitors citations from their business info - phone number and address! [*=4]Generate curated relevant lists of hundreds of citations. [*=4]Discover what is duplicated across your or competitors websites. [*=4]Get duplicate content scores based on severity. [*=4]Reverse engineer content sydication methods or find duplicate content on your own site. [*=4]Generate ranking reports for any city+region combo from around the world. [*=4]Want to know your rankings are in Paris France for google.com? how about your rankings in California Vs New York? Yep! GeoRanker can do that. [*=4]Track up to 100 keyword URL combinations. After your free trial you will be charged with the VIP BlackHatWorld Forum plan for $15 (70% off). Thank-you for your support and feedback during the beta free trial so far. Very easy to use, nice tool. Think of it as an SEO Swiss army knife. what are the limits on each service? i'd like to use this but how limiting is it? Wow. seems like an amazing service. I have the same question as @mudbutt. Interested to know. Thanks. Similar question, are we allowed to use the paid features of those tools (ahrefs etc). If so what kind of limitations are set for each tool ? Especially since you have mentioned its an "Aggregator", each tool will have different limiting factors (limit on campaigns, limit on keywords etc.). So what kind of limits is set for this tool ? nd any review copies ?? Any free review copies available? Well this looks really interesting. But would like to test it first. Any review copy ?? if there is any review copy or trial copy then let me know. How many we can check with one account per month ? Also, one more question, will the $39 price tag be applicable for the first month only, or till the subscription is unsubscribed ? I would like to give a try but what are the limitations of using this? Can I grab all the backlinks of ahrefs or it have some limitations. Same goes with semrush and other. Your account is assigned a total spend and is able to create roughly 300~ SEMRush reports. However if you created two reports within the Ahrefs module you would only be able to generate (roughly) 298 reports with SEMRush. Each account can view their account balance in their profile page. The features are outlined on the home page (which obviously may not be descriptive enough!). You can generate referring domain reports & backlink reports for domains and URLs in Ahrefs. For SEMRush you can generate domain, URL and keyword reports which display organic traffic, organic keywords and other stats. The $39 is recurring, your price will not change.